Aristotle (384–322 B.C.) rests his hand reflectively on a bust of Homer, the blind epic poet of the Iliad and the Odyssey. A medallion representing Alexander the Great, whom Aristotle tutored, hangs from the heavy gold chain. The philosopher contemplates material rewards as opposed to spiritual values, with the play of light and shadow on his features suggesting the motions of his mind. Painted for the great Sicilian collector Antonio Ruffo, the picture also refers to Aristotle’s comparison of touch and sight as a means of acquiring knowledge. This picture was painted in 1653 for the Sicilian nobleman Don Antonio Ruffo (1610/11–1678) and sent from Amsterdam to his palace in Messina during the summer of 1654. Ruffo was an avid collector; at his death he had 364 paintings, including a work by Van Dyck, Saint Rosalie Interceding for the Plague-stricken of Palermo, now also in the MMA (71.41). Though he went out of his way to collect works by famous masters, Ruffo rarely left Messina. He ordered this work through an agent, Giacomo di Battista, who did business with Cornelis Gijsbrechtsz, a wealthy Amsterdam merchant. Shortly after its delivery, the picture was recorded in Ruffo’s inventory (1657) as a half-length figure of a philosopher, possibly Aristotle or Albertus Magnus. Based on this description, Giltaij (1999) concludes that Ruffo did not have a particular subject in mind when he made the commission, but probably asked for a half-length figure of a certain size. The dimensions given in the inventory are 8 x 6 palmi, equivalent to about 178 x 134 cm. (one palmo romano was about 22.34 cm.) and considerably larger than the current dimensions of the painting. Kirby (1992) explains, however, that the dimensions in palmi used in the Ruffo inventories were inexact measurements meant only as a guide. X-radiography confirms that the painting is close to, if not exactly, its original size. In 1660, Ruffo commissioned a pendant for the Aristotle from the Bolognese artist Guercino (1591–1666), providing him with the desired dimensions and a sketch of the Rembrandt painting. In a letter to Ruffo of October 6, 1660, Guercino notes that “to accompany Rembrandt’s which I judge to represent a Physiognomist, I thought it most fitting to make a Cosmographer . . . ” Guercino’s painting is now lost, but is known from a drawing in the Princeton University Art Museum. Ruffo also ordered companion paintings from Rembrandt. They are the Alexander the Great of 1661 (now lost) and the fragmentary Homer (Mauritshuis, The Hague), dated 1663. Both are mentioned in an invoice dated July 30, 1661. 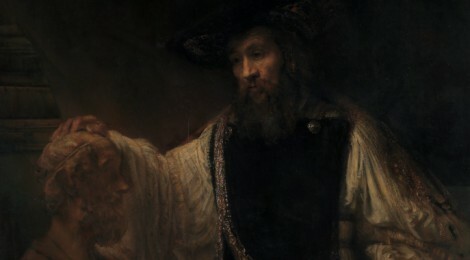 In a letter of November 1, 1662, Ruffo addressed a letter to the Dutch consul in Messina, expressing dissatisfaction with the painting of Alexander and noting that he paid more for it than for the Aristotle; that the subject was in fact Aristotle had probably been clarified for Ruffo once he commissioned the other works from Rembrandt. 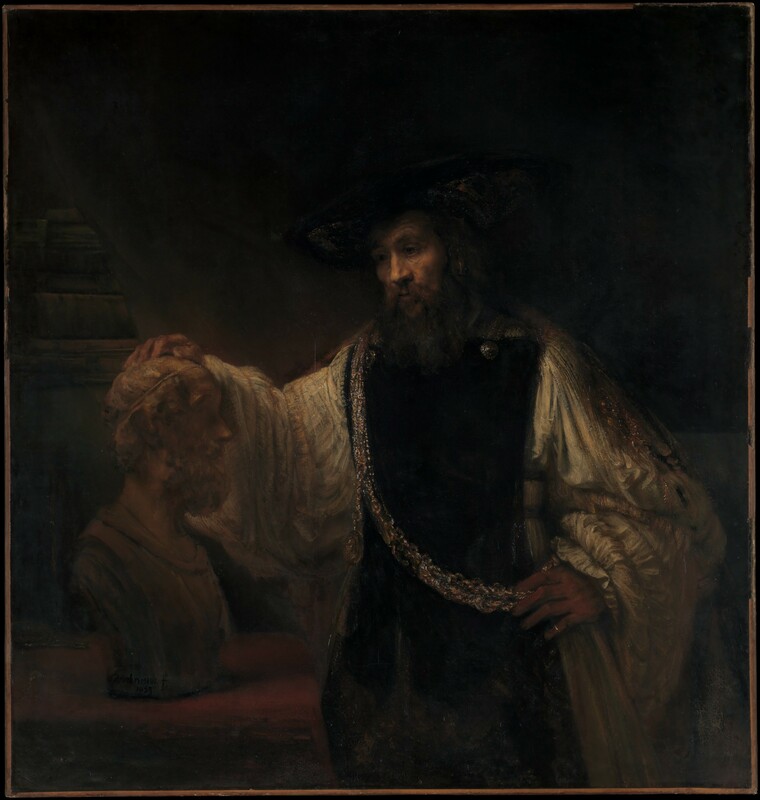 Until 1917, when Hoogewerff connected the newly published Ruffo documents with this painting, the subject had been variously identified as Ariosto, Tasso, Virgil, an imaginary man of letters, philospoher, or savant, or an actual poet or scholar of Rembrandt’s time, such as Pieter Cornelisz Hooft. Julius Held’s analysis of the subject in an article of 1969 is still widely upheld. According to Held, Aristotle compares “two sets of values”: on the one hand, everything that he admired in Homer—gravity, humility, “unequalled diction and thought”—and, on the other, wealth and worldly honor as embodied by the gold chain and medallion bearing an image of Aristotle’s royal pupil, Alexander the Great.